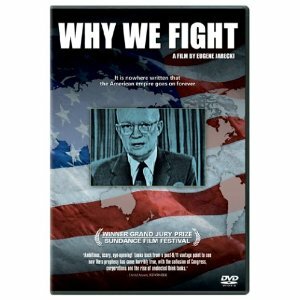 Why We Fight won the Grand Jury Prize at the 2005 Sundance Film Festival. It is an unflinching look at the anatomy of the American war machine, weaving unforgettable personal stories with commentary by a "who's who" of military and Washington beltway insiders. Featuring John McCain, Gore Vidal, William Kristol, Chalmers Johnson, Richard Perle and others, Why We Fight launches a bipartisan inquiry into the workings of the military industrial complex and the rise of the American Empire.